A dehydrator is a great piece of kitchen equipment for drying meat. There are several models of dehydrators that you can choose for drying meat. Some dehydrators have more space on their trays, other have a wider temperature range for drying meat. With all these features and more, it can be a little difficult to choose the best meat dehydrator that suits all your requirements. In this article, we are going to take a look at some of the popular meat dehydrators available in the market that are ideal for dehydrating meat of all kinds. We’ll also take a look at the best practices for drying meat in your dehydrator and the features you should look for when choosing a dehydrator for making jerky. Dehydrating meat can be a great way to make ready snacks that are full of nutrients, vitamins, minerals, and made in the comfort of your own home. There are many kinds of meats that you can dry in a dehydrator, but you also need to know the capabilities and limitations of your dehydrator to dry meat safely and properly. While beef jerky is one of the most popular types of meat that people make in their dehydrators, you can always experiment with different kinds of meat products to get the taste and type of jerky that you want to eat. Along with beef, people also dehydrate fish, chicken, pork, turkey, venison, and more. Let’s take a look at the things you need to consider while buying a meat dehydrator. If you’re buying a dehydrator solely for the purpose of drying meat, you can’t just pick any model of dehydrator, here are some things you should know before choosing the dehydrator that will best suit your purposes. If you’re dehydrating meat, you’re going to need ample space in the dehydrator. Look for a dehydrator that offers large square footage for the trays. You can also choose a dehydrator that offers expandable space options in form of trays that you can add on later. When it comes to drying meat, you will be mostly drying meat in stripes or long pieces. While you can make use of circular trays, if you have the option available, you should go for a dehydrator that has square trays as it will allow you to make better use of the space. Certain dehydrator model have a fixed temperature and you can’t change the temperature once you’ve switched on the dehydrator. This is not ideal when you want to dry meat in your dehydrator. Meat needs to be dried at varying temperatures to kill all the bacteria and pathogens in the meat. You might want to change the temperature to get a unique texture of the meat, if you like the meat crispy. That’s why it’s the best idea to choose a meat dehydrator that has a thermostat that allows you to change the temperature when required. A timer is one of the most important features of a dehydrator that you must use for drying meat. While you can use an external timer, having an in-built timer makes sure that the device will switch itself off once the drying cycle is finished. You can set the dehydrator overnight or while you’re out of your house if you have a timer in your device. Different dehydrators have fans in different positions. Keep in mind, when you start drying meat, it will lose some moisture and liquids through the process. If the dehydrator has a fan at the bottom, these liquids can clog up the fan and make it difficult to clean. 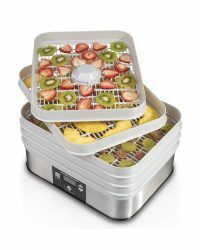 For dehydrators with fan at the top, you might need to rotate the trays so that bottom trays can also get hot air. The best solution is to get a dehydrator with fan at the back so that it can blow hot air over all the trays equally. If possible, choose a dehydrator with a transparent door so that you can view the progress of dehydration without opening the door. Every time you open the door to check if the meat has dried properly, the inner temperature drops and it takes longer for the meat to dry properly. If the door remains closed through the drying session, you can dry the meat in less time. The Presto 06301 is a digital electric food dehydrator that offers excellent performance in a small and easy to use package. The dehydrator is ideal for making all kinds of jerky from meat and it comes with sample packets of jerky spice and cure. 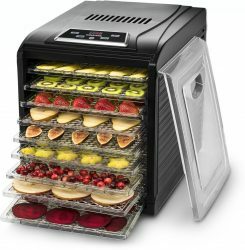 You can set up the desired temperature for drying jerky in this dehydrator as it comes with a thermostat. 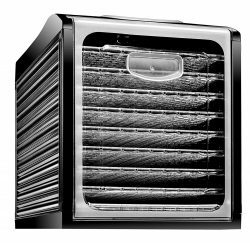 The fan in this dehydrator is mounted at the bottom and the heating element offers optimum air flow. With six trays present in the dehydrator, you can add six more trays to take the total tray capacity to 12. The trays are easy to clean as they are dishwasher safe, too. The Nesco FD-75A offers a range of features that make it ideal for drying meat. 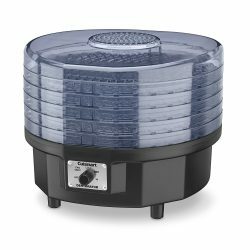 The dehydrator comes with a top mounted fan that offers 600 watts of drying power. There are five trays included with the unit and you can also add to the capacity up to 12 trays when you want to dry more meat. The exterior of the dehydrator deserves a special mention as it is made from Opaque Vita-Save material that blocks any harmful light from reaching the food. The dehydrator doesn’t send air down through the trays, but uses a patented Converga-Flow system that forces air down an exterior pressurized chamber and each tray gets hot air individually. 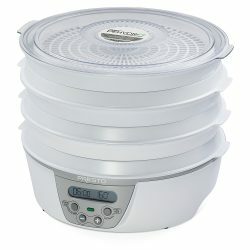 You can also adjust the temperature with the adjustable thermostat that goes from 95-160 degrees F making this dehydrator just right for drying meat. Excalibur is known for making dehydrators that are reliable, functional, and powerful enough for drying all kinds of foods. If you’re looking to buy a dehydrator for drying meats, then an Excalibur will exceed your expectations every time. This unit has 9 trays that offer 15 square foot of space for drying food. With 600 watts of power and a seven inch fan, you will be able to dry your quickly and efficiently. 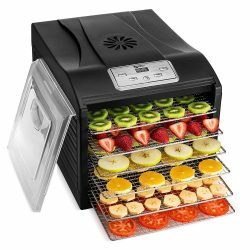 The dehydrator also comes with a 26 hour timer that is ideal for drying foods that take a lot of time to dry. You can simply set the timer and go about your day and the unit will shut down once the timer is over. Let’s take a quick look at specifications of this unit. 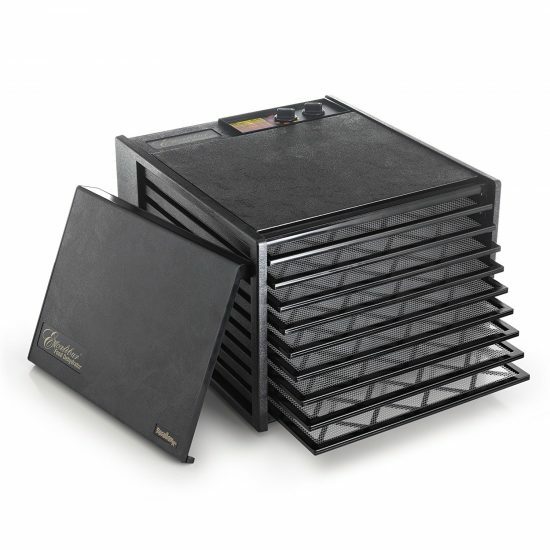 The Chefman dehydrator is a high capacity unit that comes with 9 BPA free trays that allow you to dry large quantities of meat in a single batch. You can also use the space to dry other foods along with the meat you want to dry. The dehydrator comes with digital touch settings and you can also set up a timer for 19.5 hours. 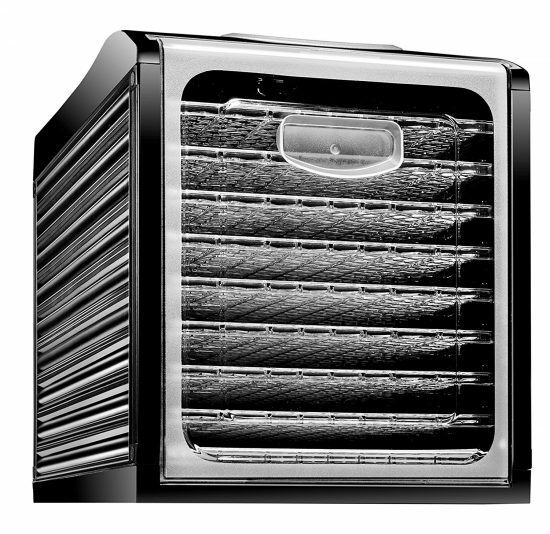 The design of the dehydrator needs a mention as it maximizes airflow for uniform heating through all trays. The dehydrator also has a transparent door through which you can monitor the progress of the drying food. Let’s take a quick look at the features and specifications of this unit. Users often have questions about meat dehydrators and how they can make the best use of these devices for drying all kinds of meat. 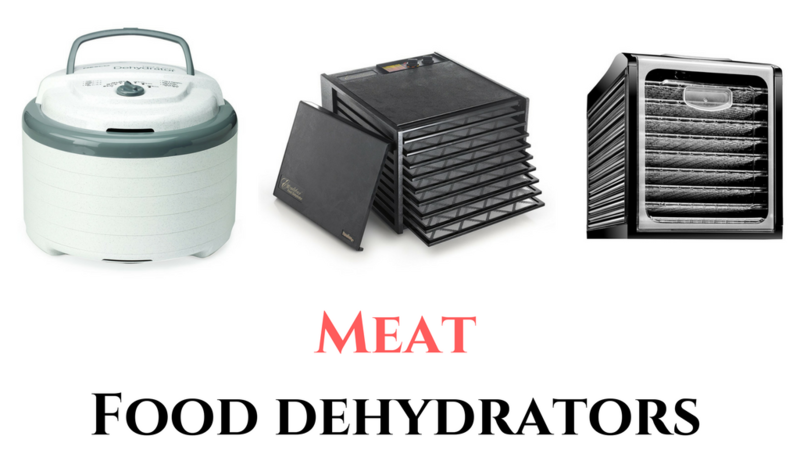 Here are some of the frequently asked questions about meat dehydrators. Q1. 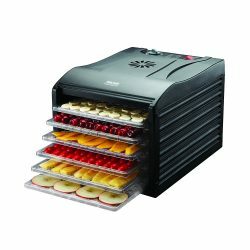 How can I dry me​at more efficiently in my dehydrator? Ans. The time it takes for meat to dry depends on a variety of factors such as thickness of the meat, type of meat, temperature in your area and more. On your part, you can try slicing the pieces in thin slices and place them on trays with ample space around them so that hot air can pass easily around the pieces. Also, avoid opening the door of the dehydrator a lot of times as it can lead to loss of heat and increase the drying time. Q2. I dried some jerky in my dehydrator and now there is residue on all the trays. How can I clean them easily? Ans. If your dehydrator trays are dishwasher compatible, you can wash them in the dishwasher at the lowest setting and with warm water. Otherwise, you can let the trays soak in a sink filled with warm water and soap solution and use a small brush to scrub off the sticky residue. Q3. What are some points I should keep in mind while dehydrating meat? Ans. Meat often has bacteria and pathogens that need to be destroyed to make it safe for human consumption. 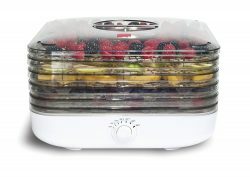 Make sure your dehydrator reaches the temperatures of 160℉ so that the heat kills the bacteria. If your dehydrator doesn’t have the provision of a high temperature, you will need to cook the meat to a high temperature before drying it. Q4. How do I know that the meat has finished drying? Ans. You can pick a piece of meat from the dehydrator and check it by bending it with your fingers. If it bends properly without breaking then it’s done and if you want a crunchy taste to the dried meat, you can consider drying it for some more time till you feel it’s crunchy enough. Q5. 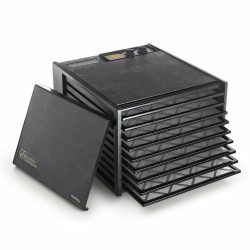 How can I make sure that the trays of a dehydrator are BPA free? Ans. You can simply look into the manual of the dehydrator or the literature that comes with the dehydrator if the mention the BPA free status of the trays. 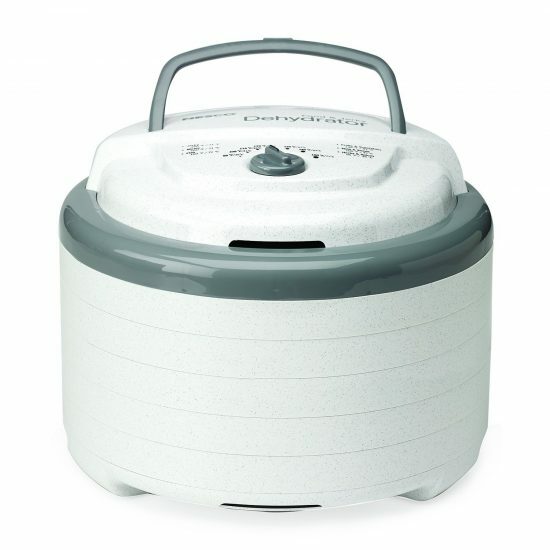 You can also look up the dehydrator manufacturer’s website and check the model to see if it’s BPA free. Buying a dehydrator for drying meat can be the best decision you can make if you plan to dry meat in large batches. Modern dehydrators offer a range of features and they also help to add a great degree of efficiency to drying meat. You can choose any of the dehydrators we’ve reviewed that has the features and specifications that meet your requirements and you will have a gala time drying meat of all kinds. For more information about dehydrators, please browse through this website. If you have any questions or queries, please leave a comment and we’ll get back to you at the earliest. Happy dehydrating!